[Ed. note] In 2012, the Israeli artist Michal Heiman came across Hugh Welch Diamond’s photograph (ca. 1855) of a patient at the Surrey County Lunatic Asylum in England, and amongst the photographs, found herself looking at a picture of her younger self. This encounter led Heiman to start a photography project looking at the conditions of possibilities for “return”, asking how are our imaginative practices bound up with the process of political recognition. 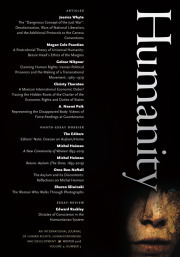 As Sharon Sliwinski asks in her essay included in this issue: “Is the asylum a place or a state of mind? How does one enter these gates? And how does one return home?” The Return/Asylum: A New Community of Women, 1855–2019 now consists of over 150 photographs and 120 videos of asylum-seekers, political activists, artists, academics and others. The work explores photography’s ability to penetrate traumatic experience and transport, through different strategies, subjects across time and place, in an attempt to create a new community. This dossier consists of four photo essays, two by Michal Heiman on the Return/Asylum project, and two further essays by Orna Ben-Naftali and Sliwinski reflecting on the work. Abstract: In 2012, I came across The Face of Madness: Hugh W. Diamond and the Origin of Psychiatric Photography (1976) and had a crucial encounter with a photograph by Hugh Welch Diamond’s c. 1855 of a patient at the Surrey County Asylum in England (plate 34). From the photo looking at me was my younger self and this encounter led me to a project seeking to contribute to envisioning the political, cultural, gendered, and psychic conditions of possibilities of “return” with its numerous inflections: returning to the Asylum, to another era, to the 19th century, returning to the site of a traumatic experience, the return of the suppressed, the right to return, the phenomenon of psychoanalytical regression, etc. This inspired me to begin several projects, which explores and questions photography’s ability to penetrate traumatic experience, attempting to create a new community, comprised of dozens of women, asylum-seekers, activists, artists, etc. (1885-2019).